Information about SRI initially came to the Philippines through several paths. The International Institute for Rural Reconstruction (IIRR) took an early interest in SRI after Norman Uphoff visited its center in Cavite in 1997. In June 1998 it hosted a national NGO seminar on rice, cosponsored with ILEIA, and CIIFAD supported participation by Justin Rabenandrasana, secretary of Association Tefy Saina in Madagascar, to introduce SRI to NGOs in the Philippines. ILEIA invited Rabenandrasana and Uphoff to provide an article on SRI for its newsletter. The CIIFAD website also provided information on the innovation. In 1999, the Consortium for Development of Southern Mindanao Cooperatives (CDSMC) conducted its first trials in Mindanao that resulted in 4.95. t/ha, a substantial increase from the usual yields of 1.5-2.5 t/ha. Adaptation of SRI concepts to upland rice production were then made by Broader Initiatives for Negros Development (BIND) based in Bacolod City. It conducted trials adapting SRI to upland conditions in Negros between 1999 and 2002, with results for some spacings averaging over 7 t/ha. After the director of the Agricultural Training Institute (ATI) in the Department of Agriculture learned about SRI at a conference in Indonesia in 2000, the ATI center in Southern Mindanao undertook trials that averaged over 7 t/ha in 2001 and 12 t/ha in 2002. In 2004, the Cotabato ATI center reported even higher SRI yields. The International Rice Research Institute (IRRI) at Los Baños, however, reported a disappointing yield of only 1.44 t/ha in its 2003 trials followed by a yield of 3 t/ha in 2004. The Philippine Rice Research Institute (PhilRice) trials similarly did not report significant increases with SRI. Engr. Carlos Salazar, at the time a Regional Irrigation Manager in eastern Mindanao for the National Irrigation Administration (NIA), undertook experiments on his own farm that resulted in yield of 6.9 tons in 2003, 8.9 t/ha in 2004, and 9.6 in 2005. His adaptations, called "Sustainable System of Irrigated Agriculture" (SSIA), are included in a World Bank Institute instructional video (right). SRI trials in 2005 at Visayas State University’s Farm and Resource Management Institute (FARMI) in Baybay City on the island of Leyte, registered SRI yields of 10.16 vs. non-SRI yields of 3.48 t/ha. PRRM has worked with the NGO Save the Ifugao Rice Terraces Movement (SITMO) in promoting SRI in the Ifugao Terraces, a UNESCO World Heritage site, with positive results for for several years. Reports of trials by a number of NGOs and government agencies as well as university research by graduate students and faculty at University of the Philippines at Los Baños and other universities are covered in a 2004 report by Roberto Verzola. (Several UPLB master's theses are listed in the articles section below). During 2017, an SRI entry using an inbred variety placed 9th in yield out of 19 entries in a national rice derby (and with much lower costs), well ahead of the PhilRice entry. In 2017 and 2018, the ZIDOFA group in Panay won awards and accolades in the Philippines for helping farmers to both grow and successfully market organic SRI rice. SRI-Pilipinas sent a four-person delegation to attend the Workshop to Enhance Cooperation and Sharing among SRI National Networks in Asia, held October 18-19, 2018, in Johor Bahru, Malaysia. This workshop helped tie SRI-Pilipinas more closely to other national SRI networks throughout Asia. During November 2018, the Department of Agriculture (DA) announced that it will be conducting SRI training for its staff who are involved in the DA's rice program. SRI-Pilipinas conducted the first training December 5-6, in cooperation with the DA's training arm, the Agricultural Training Institute (ATI). Thirty staff from 13 (of 16) regions attended. [December 6, 2018] In a breakthrough for SRI in the Philippines, the Department of Agriculture (DA) has announced that it would be conducting SRI training for its staff who are involved in the DA's rice program. The DA asked SRI-Pilipinas to conduct the training, in cooperation with the DA's training arm, the Agricultural Training Institute (ATI). The DA made the announcement at the National Organic Agriculture Congress held in Cebu City on Nov. 13-15, 2018. Led by SRI-Pilipinas National Coordinator Mario Descalla, the first training took place on Dec. 5-6, 2018, at the the PhilRice Research Station in San Mateo, Isabela Province. The training involved lectures and practicum, and then a season-long trial/demonstration by each participant on a 100-500 square meter plot. More than 30 DA staff attended, and 13 of the 16 regions were represented. (Three regions were missed due to short notice). The result of these trials will determine how well the trainees have learned SRI principles and practices. SRI-Pilipinas trainers in the various regions will make themselves available as resource persons during the season-long trials. Prior to the participating in the SRI Networks Workshop in Malaysia, Verzola attended the 5th International Rice Congress (IRC) in Singapore, held October 15-17, 2018. During the Congress, he also helped provide SRI information to the event participants from the SRI-Rice/Oxfam booth. [January 26, 2018] The Department of Science and Technology (DOST) Secretary Fortunato T. de la Peña commended a group of organic farmers in Zarraga, Iloilo, for providing scientific knowledge and cutting-edge technological innovations to the public. De la Peña cited the Zarraga Integrated Diversified Organic Farmers Association (ZIDOFA), an NGO dedicated to creating a closed-loop organic food value chain, during his visit to its project site. ZIDOFA promotes the SRI methods toachieve greater yields by helping small-farmers interested in converting some of their lands to organic farmareas undergo series of trainings and seminars. The group's assistance, however, continues from nursery management until post-harvest drying and milling, packaging and marketing. “Congratulations, you might be the first agricultural product to be endorsed in OneStore. This is something well accomplished,” said De la Peña. DOST’s OneStore is an e-commerce web application platform that operates nationwideand caters primarily to Philippine consumers which aims to further assist the Micro, Small and Medium Enterprises (MSMEs) widen the scope of their target market. 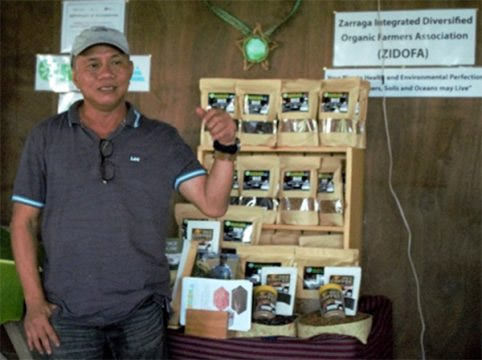 [November 13, 2017] A recent article by Joby Arandela on the Panorama website outlines how the Zarraga Integrated Diversified Organic Farmers Association (ZIDOFA) on Panay (click on map at left to enlarge location) is spearheading an initiative that uses a holistic value chain approach in order to produce high quality, safe, affordable and healthy organic SRI rice for Filipino consumers, while protecting, conserving and restoring biodiversity in the farm and marine and coastal ecosystems. According to Arandela, this will bring the benefits and the credit back to the farmers and empower them through the creation of a closed-loop organic SRI rice value chain devoid of exploitative middlemen and traders. The immediate beneficiaries are the small-farmers and their families and the 8 barangays (villages) they live in, though 40,000 other farmers could potentially be impacted. The Panorama Solutions for a Healthy Planet, of which ZIDOFA is one, were presented a side event at COP23 in Bonn on November 16, 2017. Due to its organic SRI initiative, ZIDOFA has also been in the news recently, having been chosen as one of the BPI Sinag Accelerate top 5 Social Enterprises in the Philippines from among 20 finalists. (See BPI Sinag's short facebook video on ZIDOFA). The recognition comes with 500k Php (~10,000 USD), which is earmarked for purchase and consolidation of SRI farmers' organic paddy rice, including drying, milling, packaging and eventual marketing. With this award, Arandela feels that ZIDOFA is slowly nearing the targeted completion of a closed-loop organic SRI rice value chain. (The rice mill and warehouse structures and the delivery vehicles are the last remaining critical gaps to be filled.) In addition to the BPI Sinag Accelerate achievement, the Department of Agriculture Regional Field Office 6 has awarded a mechanized transplanter to ZIDOFA at the Western Visayas Integrated Agricultural Research Center (WESVIARC), which was handed over by the Agriculture Secretary on November 17 as part of his program to mechanize agriculture. (See Panay News article for details). [February 2017] AGREA Philippines, a social enterprise and foundation, has been making progress with promoting SRI and other agroecological activities on the island of Marinduque in the Philippines. A recent video about Cherri Atilano, AGREA's founder and president, is available in the series on ASEAN's Nest Generation Leaders. 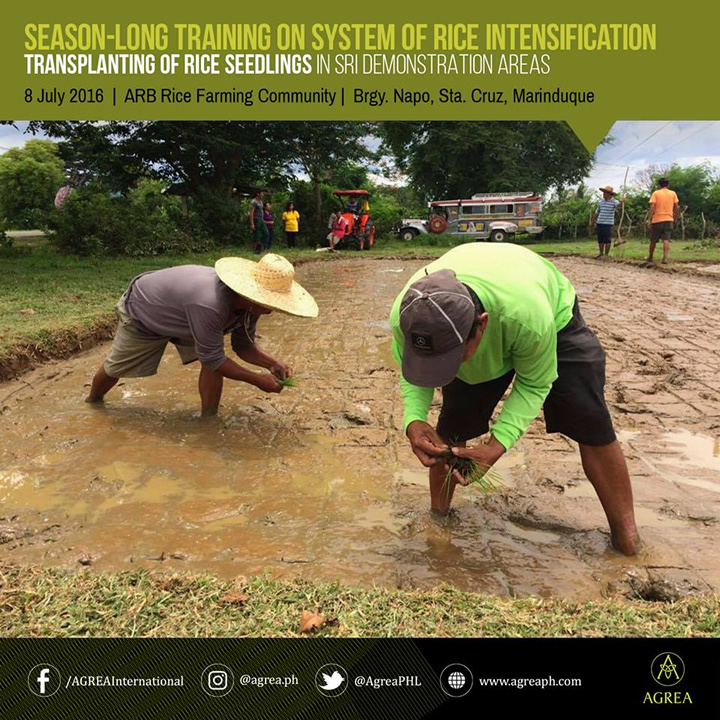 During 2016, AGREA began working closely with the Department of Agrarian Reform (DAR) Marinade Office and the SRI-Pilipinas Network in the implementation of a season-long System of Rice Intensification training in Marinduque, Philippines. Demonstration farms are being set up in five rice farming communities in Brgy. Cawit in Boac, Brgy. Napo and Brgy. Baliis in Sta. Cruz, Antipolo, Brgy. Malibago in Torrijos, and Brgy. Malbog in Buenavista. According to Venancio Garde, SRI Pilipinas trainer for this season-long program, "SRI increases the rice yield by a great margin, 20% or more.... When they try SRI and earn from it, there is no going back." Atilano added, "We are replicating effective farming systems so that we can create food security in the island. It all boils down to this: When there is food security, there is food sovereignty. There will come a time when all the food consumed in Marinduque are farmed by Marinduque farmers." According to Senior Agrarian Reform Program Officer Ella Orilla, DAR supports the SRI program as it demonstrates viability of SRI organic farming, and "to establish income generating projects for our beneficiaries, to develop important organic farming skills and to promote self-reliance for our farmers." SRI has been identified as a solution for climate and disaster risk resiliency. [September 26, 2016] Pasali's Extension Service Provider team recently conducted a three-day training on System of Rice Intensification (SRI) methodologies August 30 to September 1, 2016, at Pasali Learning and Resource Center in Barangay Baliango, Palimbang, Sultan Kudarat. The training, which was attended by 31 farmers from different barangays of Palimbang, was intended to promote SRI as climate-smart agro-ecological methodology for increasing the productivity of rice by changing the management of plants, soil, water and nutrients. According to the article on Pasali's website, the training fits with the government’s plan to attain rice sufficiency within the first two years of Duterte Administration. The training was facilitated by Prof. Mansueto Cuaton from the Mindanao State University College of Agriculture, who noted that farmers have an opportunity to produce organically grown rice products and traditional rice varieties through SRI. The training was enhance by Pasali's experience with SRI, which which began in 2005. Pasali also worked on a number of manual and mechanized weeder prototypes between 2005 and 2011. An April 14 article on the Philippines Information Agency website, which also covers Rullamas' achievements, further expands on the role of the Aringay municipality's support for SRI extension in La Union. Engr. 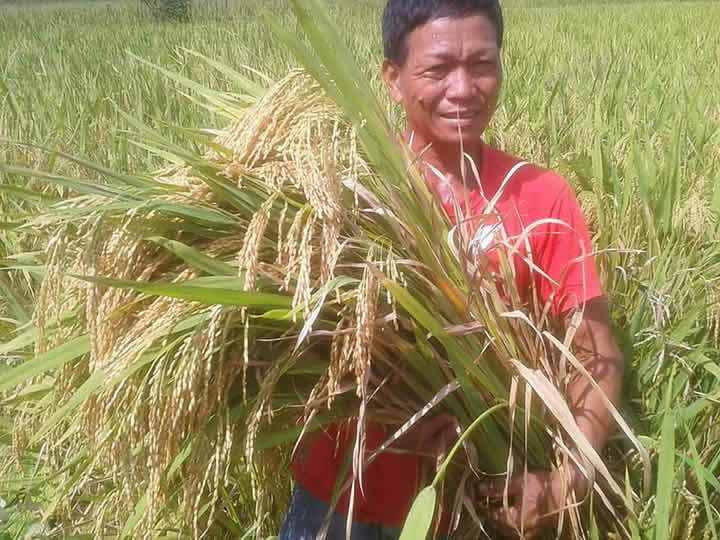 Benjamin Magno from the the local agriculture office reported that the local government provided four months of seed-to-seed training to the farmers to boost their rice production. Beginning with four farmer-adopters in 2013, there are now 120 farmer-adopters of SRI in eight villages in the municipality. The Aringay government allotted an annual budget of P300,000 (about $6,350) from the development fund to ensure sustainability of the program, which includes provision of training, assistance in the production of organic fertilizers and pesticides and equipment. To further educate other farmers regarding SRI, a 1.6 hectare techno-demo farm, in partnership with the Don Mariano Marcos Memorial State University, is expected to be developed this year. 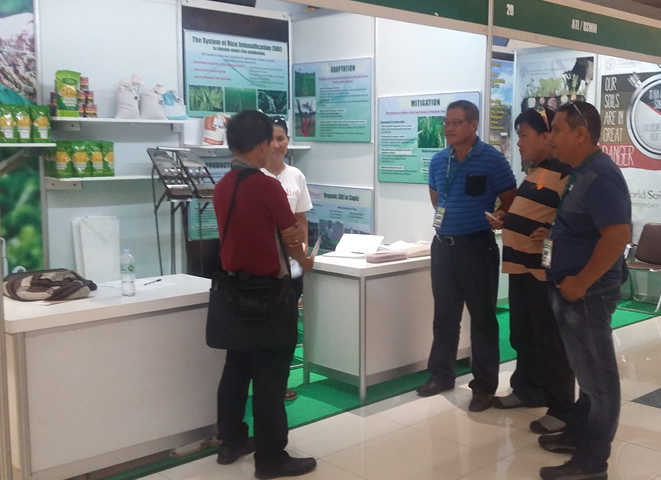 [December 15, 2015] Joby Arandela and farmers from the Zarraga Integrated Diversified Organic Farmers Association (ZIDOFA) in Iloilo, Philippines, who have successfully y grown indigenous rice varieties with System of Rice Intensification (SRI) methods this season, manned an SRI booth (right) at the National Organic Agriculture Congress in Bacolod City, Negros Occidental. This event, which included an exhibition and trade fair, was held November 25-29, 2015. Visitors to the booth were reportedly so impressed by the differential and profusely-tillering SRI plant specimens (left) that many begged to buy ‘SRI seed’ for themselves. This gave Joby and the Iloilo farmers at the event an opportunity to explain that the difference was not due to the seed used, but to the management methods employed. Several attendees from Mindanao who were already practicing SRI joined the Iloilo farmers at the booth to help explain SRI to curious attendees. One of the four rotary weeders on display was bought by the Vice Governor of Surigao Province since he was intending to introduce SRI to farmers there. 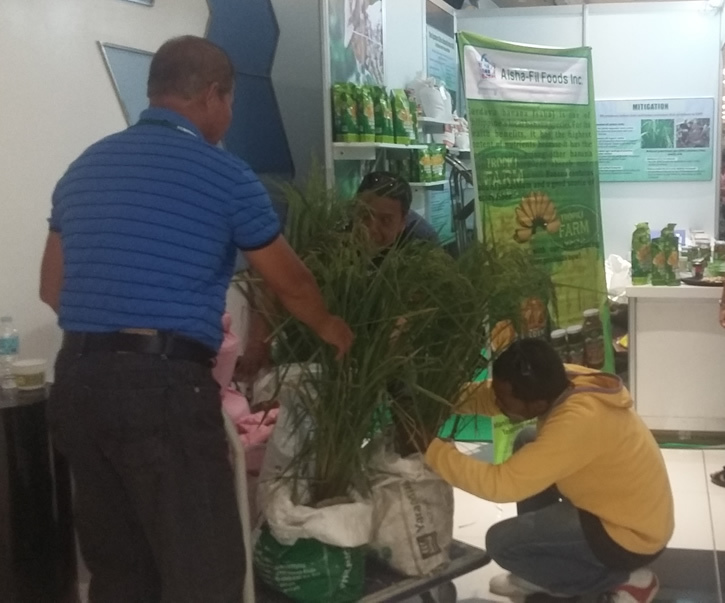 There was interest from organic businesses as well as organic farms in the Iloilo rice as well as requests to provide SRI training to farmer groups in other regions. [November, 2015] Although the El Niño phenomenon has been affecting parts of the Philippines with season-long droughts, rice in SRI fields is successfully being harvested in Marabut and Basey on Samar Island, Philippines. 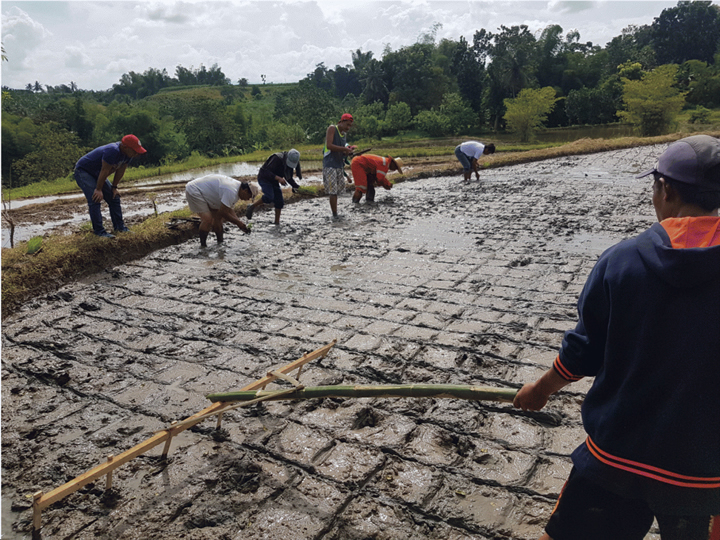 Farmers associated with the Caritas Czech Republic project being implemented by Diocese Social Action Center of Calbayog (DSAC) have gained knowledge how to plant resilient, organic rice with less water. By using SRI methods, the beneficiaries reportedly are among the few farmers able to harvest rice in rainfed areas in Samar. SRI methods are being used to promote organic farming and encourage local production of organic fertilizers in Samar. For more information, see the Philippines page of the Caritas website. [October 22, 2015] Separate graduation ceremonies on October 21 and 22 marked the successful conclusion of the five-month season-long training on "Organic Rice Farming Using SRI" in the towns of Siocon and Sirawai, both in the province of Zamboanga del Norte. Town mayor Julius Lobrigas attended the October 21 ceremony in Siocon, and town mayor Gamar A. Janihim attended the October 22 ceremony in Sirawai. Officials of the Department of Agrarian Reform were present in both ceremonies, as well as the national coordinator Roberto Verzola and regional coordinator Adelberto Baniqued of SRI Pilipinas. Displayed during the ceremonies were sample rice plants that produced as many as 63 tillers from crop cuts that suggested yields of 6 tons/ha in some trial plots up to 8 tons/ha in other trial plots. During the ceremonies, farmers happy and surprised at the results, having attained them with lower costs and without chemical inputs. The Southeast Asia Conference on the System of Rice Intensification (SRI), held May 26-28 in Alor Setar, Malaysia, was attended by four participants from the Philippines: Dr. Carmelita Cervantes of the Central Bicol State University for Agriculture (Pili, Camarines Norte) and SRI Pilipinas coordinator for Bicol, retired director Adelberto Baniqued of the Department of Agrarian Reform Region 9, currently SRI Pilipinas coordinator for Western Mindanao, Lala Pablo of the Rice Watch Action Network (RWAN), and Roberto Verzola, SRI Pilipinas national coordinator. Verzola, shown at right demonstrating his planting technique at the SRI Lovely field visit, made a presentation on the SRI Pilipinas experience in promoting SRI. Baniqued and Pablo also made presentations on their activities. Cervantes attended the special session on the multi-country SRI-Rice arsenic project, which she is taking part in. The Philippine participants were present at the side events for SRI equipment development, the SRI Global Research Network, and a meeting on the final day of the conference to begin creating a SE Asia regional SRI network. [May 15, 2015] According to an article on the Department of Agrarian Reform website, about 120 agrarian reform beneficiaries (ARBs) in Zamboanga del Norte are graduates of the System of Rice Intensification (SRI) training offered by the Department of Agrarian Reform (DAR). DAR Regional Director Felix Aguhob, who said the course aims to train ARBs in increasing the production of organic rice, also noted that while labor intensive, the yield with SRI is double the normal rice yield. The three-month intensive training was simultaneously conducted in the four barangays of Dipolog City namely Barangays Olingan, Punta, Turno and Gulayon. Farmer are expected to share the SRI methods with other farmers to increase their productivity. Mayor Evelyn T. Uy emphasized the importance of team work and dedication of the people behind the implementation of the Intensive Training for Organic Rice Production through SRI. Climate resilience: Felix Sarte, a rice seed grower from the municipality of Limay, in Bataan Province, discussed resilience of his SRI-grown plants with Roberto Verzola (see photo set). As seen in the photo at left, the non-SRI fields on the left has lodged after high winds, while the SRI field did not. Sarte reported that the thick and deep roots that rice plants develop when they go through a series of wet-dry spells (also called intermittent irrigation, or alternate wetting and drying) help the plants in a number of ways. During the dry spells, the plants send out more roots to search for water. As the upper part of the soil dries, and the water level goes down, the roots grow towards the water. Thus, they go deeper. With thick and deep roots, he says, the rice plants withstand strong winds, flood water and typhoons better. They can also survive droughts longer, because they can find more moisture in deeper soil. (John Vidal also mentions SRI in relation to climate change resilience in his March 31 article in the Guardian's Global Development blog.) This makes SRI a great adaptation measure for coping with extreme weather events and other climate change impacts. [September 9, 2013] At least 115 participants have entered the organic SRI contest that is ongoing throughout the Philippines. Representatives from the Department of Agriculture, the village government unit, and SRI-Pilipinas were present to supervise the competition's first crop cut, which took place in Camarines Sur Province on September 9. Contestant harvests will continue every few days until contest competition deadline on December 15. The second round with begin during early 2014. SRI-Pilipinas will announce the officially verified SRI record high after the second round; all yield measurements include at least 4,000 sq. According to Roberto Verzola, the contest target is to set the Philippine record for rice yield .... and keep it. SRI-Pilipinas, the contest sponsor, has prepared maps of the locations of the participants in Luzon and in Palawan, Visayas, and Mindanao. The details of the contest can be found below. [July 1, 2013] A 137 page book on the System of Rice Intensification is now available from SRI-Pilipinas for P300 including shipping. Written in Pilipino, Ang Sistema sa Pagpapalago ng Palay is for farmers, cooperatives and other groups interested in SRI methods. Group trainings and free primers are also available to individual farmers by texting Roberto Verzola at (0939) 1178999. Round 1 will be held in the second cropping season of 2013 (June - Nov. 2013). This qualifying round will select the highest-yielding entries from three categories of small-scale SRI trials (in plots of 100-500 m2). The selected entries qualify for the second round. Round 2 (the second and final round) will be held in the next cropping season (the 2014 dry season for irrigated, and the 2014 wet season for rain-fed). This round will select from production-scale SRI trials (in fields of at least 4,000 m2) the five highest-yielding entries in each category, who will be declared the contest winners. The top five winners in each category will receive cash prizes ranging from 1,000 to 20,000 pesos. Any rice farmer (farm owners, tenants and farm workers) in the Philippines is welcome to join. SRI trainers will have a separate category. (Details are available by contacting the SRI Pilipinas Hotline: 0939-117-8999). Participants will receive free training materials and lessons so that they may follow the recommended SRI principles and practices and avoid practices that would disqualify them from the contest. SRI Pilipinas will hold a free seminar (no hands-on) or training (with hands-on) for at least ten contestants (a partnership counting as one) who request such a service. [April 7, 2013] A recent mb.com.ph article reported that the Philippine government signed a memorandum of agreement (MOA) on rice trade with the Kingdom of Cambodia to pave the way for the National Food Authority (NFA) to import rice from that country for the next two years. The MOA opens the way for the NFA to import rice from Cambodia through Green Trade, a Cambodian public enterprise. The article further reports that Cambodia’s success in rice farming can be attributed in large part to the Cambodian Center for Study and Development in Agriculture (CEDAC), an NGO that has promoted SRI methods since 2000. Between 2002 and 2010, Cambodia’s rice production ballooned from 3.82 million tons to 7.97 million tons. Y.S. Koma, CEDAC's Director, was given the prestigious Ramon Magsaysay Award last year for his contributions to farming technology in Cambodia. Over 100,000 Cambodian rice farmers are reportedly now using SRI, which dramatically cuts down on the use of agrochemicals. 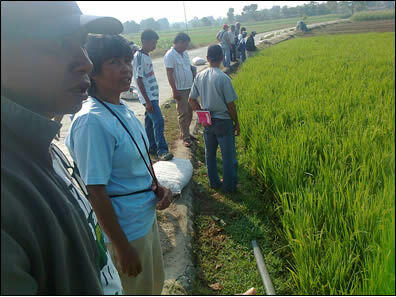 [June 25, 2012] Between 2010 and mid-2012, SRI-Pilipinas has conducted around 120 trainings nationwide, each training attended by 20-25 farmers. Usually a training includes a demo SRI trial on a small plot, so most trainings also involve one SRI trial (and therefore one adopter, the farmer who provided the plot where the demo trial is conducted). The interactive map at right, constructed by Roberto Verzola during May 2012, pinpoints resource persons as well as locations of individual trials by farmer-adopters in Luzon and Mindoro who first tried SRI after requesting and receiving the SRI-Pilipinas primer. The map at left shows these locations for the Visayas and Mindanao. (Click on the blue icons for farm names and white icons for trainer locations.) SRI trainers, and the trainings are gradually being added in, so be sure to check for updates in the near future. [January 2012] SRI-Pilipinas' 2011-2012 National SRI Training Project is currently underway throughout the Philippines with the assistance of Oxfam Great Britain. A National Evaluation/Planning Workshop/Conference was held on July 29-31, 2011, at the Department of Agriculture, Quezon City, followed by a smaller meeting that was held on November 10-11, 2011, for Mindanao trainers. One hundred one-day SRI trainings were planned for 2011-2012. As of January 2012, trainings by 13 trainers in 24 municipalities in 12 provinces had been carried out. Through the National SRI Training Project, which also supports research on SRI, SRI-Pilipinas is currently collaborating with researchers and students at the University of Southern Mindanao, Kabacan, and Western Mindanao State University. Discussions on supporting collaborative SRI research are also underway at Central Luzon State University, Visayas State University and the University of the Philippines at Los Baños. Since August 1, 2011, SRI-Pilipinas has distributed, through the operation of its SRI Hotline, more than 600 copies of the SRI Primer. Sixty copies of the SRI video and around 30 copies of an SRI Book were also distributed. As in the previous year, the primers were distributed to farmers who texted their name and address to the SRI Hotline (0939-117-8999); the videos where sent by courier to those farmers who, after receiving the primer or engaging the Hotline in conversation, decided to actually try SRI out in their rice field. The SRI Book is primarily provided to government officials, academics, and other individuals and institutions. Of 636 SRI Primers distributed, 41.3% of those who confirmed receipt of the booklet said they will try SRI, and 15.4% actually tried it. The SRI Hotline has proven itself a viable supplementary tool for social marketing among the least privileged. A Bisayan language SRI Hotline is being considered and if successful, other languages may follow. The NGO PASALI, which began promoting SRI in 2006, is now officially partnering with Catholic Relief Services for the extension of SRI trainings in Mindanao, particularly Sultan Kudarat. PASALI's Tagalog-language SRI manual is now online as are two 2010 videos showing weeders technical staff are involved in developing and testing for the NGO's projects (see motorized weeder and 12V battery drive motorized weeder videos). According to Shane Pulmano, PASALI has been selected to be the Department of Agriculture's service extension provider for SRI and is awaiting the official seals of this partnership, which should translate into extension of SRI into more areas as well as closer ties with the government agriculture programs. He also noted that the NGO Rural Development Institute of Sultan Kudarat (RDISK), who undertook a 2010 SRI training with PASALI, has recently received Oxfam support for promoting SRI in RDISK's Mindanao projects. Additional Mindanao news: A Sun Star article reported that SRI was included in the First Mindanao Organic Farming Congress, held Feb. 19-22, 2012, in Dumingag, Zamboanga del Sur. Verzola, Roberto. 2015. SRI advocacy in the Philippines: A case study. Ecology, technology and social change website. May. Gasparillo, Robert. 2002. SRI experience in the Philippines. Paper presented at the international conference on Assessments of the System of Rice Intensification (SRI), April 1-4, in Sanya, China. Arandela, Joby. 2017. The System of Rice Intensification (SRI) in the Philippines to benefit farmers, consumers and biodiversity. Panorama website. November 13. Meniano, Sarwell Q. 2017. Samar town to showcase rice planting technologies. metrocebu webiste. June 8. [Participating firms of Samar rice derby 9Samar, Philippines) are SL Agritech, Bayer Crop Science, Syngenta Philippines, Longping Tropical Rice Development, PhilsCAT, DuPont Pioneer Hi-Bred and, SeedWorks, PhilRice and, the System of Rice Intensification technology led by DA regional office. Sarian, Zac B. 2017. Just one rice seedling per hill will yield high. Manila Bulletin. May 6, 2017. Sarian, Zac B. 2017. From 50 cavans to 200 cavans per hectare Manila Bulletin. April 27, 2017. Sarian, Zac B. 2017. Dennis Miguel: Set to establish record yield in rice. zac b. sarian blog. March 8. Hilario, Frank. 2016. Green dreams: IRRI shares the hope. iWord Affairs blog. October 27. Verzola, Roberto. 2016. SRI Stories: Meet Federico Rullamas, an SRI Farmer in La Union, Philippines. SRI-Rice website. January 15. Reambonanza, Soccorro. 2015. DAR trains farmers in rice intensification. Department of Agrarian Reform website. May 11. Bollier, David. 2013. Insights from the Asian deep dive on the Commons. David Bollier blog. March 26. Ordoñez, Ernesto M. 2014. The very serious rice problem, Philippine Daily Inquirer. May 6. Bernabe, Kirstin. 2013. Filipino rice farmers urged to follow India, Philippine Daily Inquirer, May 24. 2012. 2012 Magsaysay awardees teach farmers science and business, PhilStar, October 14. Quismundo, Tarra. 2012. Cambodian rice expert produces 'more with less', Inquirer Global Nation, August 30. Bondoc, Jarius. 2012. Northern Metro Manila sinking fast - experts, Philippine Star, August 29, Opinion section. Ng, Jennifer. 2012. Ramon Magsaysay awardee pushes SRI for palay production. Business Mirror August 28. Batas, Mauricio. 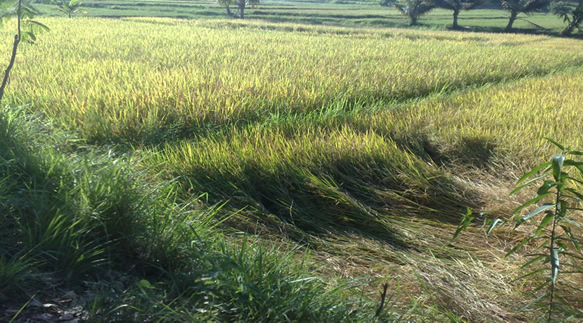 "SRI": Revolutionary way of rice growing in RP, Zamboanga Today Online, August 16. Benaning, Marvyn N. 2012. New rice growing method pushed, Mb.com.ph, May 2. 2012. Extension of the System of Rice Intensification. A Single Grain of Rice blog. February 18. Garcia, Bong. 2012. First Mindanao organic farming congress set. Sun Star, February 17. Similar article: 2012. Zambo Sur to host 1st Mindanao Organic Farming Congress, Agro-Tourism Fair. Mindanao Examiner, February 17. 2011. Indian farmer sets new world record in rice yield. The Philippine Star, agriculture section. December 18. Benaning, Marvyn N. 2011. SRI-grown rice resists typhoon. Pakistan Rice Bank website. October 8. Benaning, Marvyn N. 2011. Primer on rice growing method. High Beam Research website. September 7. 2011. Modern rice farm system pushed. The Philippine Star, May 1. Benaning, Marvyn N. 2011. Drought-tolerant rice variety holds promise. High Beam Research website. March 3. 2010. Colombia farmers visited SRI farmers of Palimbang. BlueMarty blog. November 29. 2010. The efficient mechanized weeder. BlueMarty blog. September 9. 2010. Pasali speaks with Department of Agriculture. A Single Grain of Rice blog. September 9. 2010. CRS and three of its partner organizations visited Pasali for SRI training and exposure. BlueMarty blog. July 17. Osorio, Emmanuel Libre. 2009. RP can be sufficient in rice within one year. FoodQS.com. September 24. Mayuga, Jonathon. 2009. UP study shows benefits of organic rice production. Business Mirror, July 13. 2009. 508 farmers trained, 718 more benefit from techno-demo farms under organic agriculture program — DA in balita-dot-ph. April 10. Bulayngan, Vercy. 2009. SITMO introduces System of Rice Intensification to Ifugao farmers. PIA Daily News Reader. February 21. Remo, Amy. 2008. 'Go Organic' campaign launched with P20M. Philippines Daily Inquirer, November 6. Fromm, Joseph. 2008. Jesuit innovation increase rice production. Good Jesuit, Bad Jesuit blog. March 30. Mariano, Dan. 2008. System of Rice Intensification. The Manila Times, opinion section (online). March 31. Verzola, Roberto S. 2004. 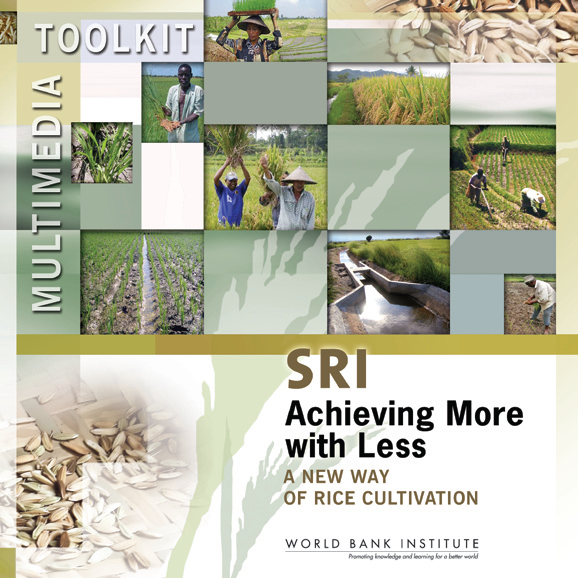 System of Rice Intensification (SRI): Practices and Results in the Philippines. Ecology, technology and social change blog. A National SRI Workshop hosted the Philippines Rural Reconstruction Movement (PRRM) was held in Quezon City on March 19, 2004. A Farmer's Symposium, hosted by the Philippines Rural Reconstruction Movement (PRRM) and co-sponsored by the Philippine Greens, was held March 12, 2003. A National SRI Workshop hosted the Philippines Rural Reconstruction Movement (PRRM) was held in Quezon City (?) during April 2002. 2017. (November 5). BPI Sinag Finalist: ZIDOFA. 0.57 min. BPI Sinag Facebook. 2013 (September 28). Interview with Interview with Eddy Pedroso Canyuto about the System of Rice Intensification. 3:02 min. SRI-Rice channel, YouTube. 2013 (September 24). Interview with Roberto Verzola, SRI-Pilipinas Network (Philippines). 1:50 min. SRI-Rice channel, YouTube. 2013 (September 22). Interview with Joey Tolentino, "weekend SRI farmer" in Laur, Nueva Ecija, Philippines. 5:00 min. SRI-Rice channel, YouTube. 2007. SRI, Seeds and Software: Converging Advocacies? - PowerPoint presentation given by Roberto Verzola, Coordinator, SRI Pilipinas Rice Research Institute at a workshop on SRI, held at the World Rice Research Conference, Tsukuba, Japan, November 7, 2004. 22 slides. - PowerPoint presentation by Dobech Enquayehush Mulu, MSc University of the Philippines, Los Baños. 61 slides. -PowerPoint by Zosimo M. de la Rosa, Regional Program Coordinator, Dr. Fe M. Gabunada, and other program participants. 39 slides. - PowerPoint presentation. 10 slides. - PowerPoint presentation compiled by R.C. Lazaro. 6 slides. - PowerPoint presentation on trials supported by the subproject staff, Municipal Agriculture Office, and the Agricultural Training Institute as well as the consultants’ consortium for SPISP. 17 slides. - PowerPoint for the Southern Philippines Irrigation Sector Project (SPISP) of ADB, and the Lower Agusan Development Project (LADP) of the Japan Bank for International Cooperation. 11 slides. 2004. SRI Trials - Analysis Trials Carried Out on the Personal Farm of the Regional Irrigation Manager of NIA Caraga Region 13 in 2003. - PowerPoint presentation on trials at the personal farm of the Regional Irrigation Manager (RIM) for NIA Region 13 in Caraga, Mindanao . 8 slides. - PowerPoint presentation by Rene Jaranilla, Dionito Eñano and Gerry Garingalao about SRI experiences in Guimaras in Western Visayas. 35 slides. -PowerPoint presentation by Roger Lazaro, SPMOs at Magballo, Butuan, and Cebu. 20 slides.